Fake news sites are a recent marketing tactic used to sell a variety of offers, most commonly work at home programs known as Google Biz Kits. Some of the more notorious programs include Google Money Tree, Easy Google Profits, and Internet Wealth Builder. 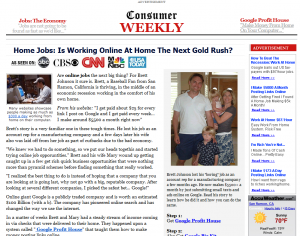 These fake news sites all follow the same basic template in which the site poses itself as a local online paper running a feature story on a successful work at home Mom or Dad. The website owners use an IP tracking tool to make sure that the papers all have your local town in the heading. So for instance if you live in Fresno, CA when you visit the site the heading would read “Fresno Times” and accordingly for anyone else who visits those sites. The whole point of this facade is to build trust by having you associate someone successful from your neighborhood with a Google Biz Kit; they build this trust and then use it to boost their sales numbers. The news article is completely fabricated and the entire story of the man who “quit his boring day job and is now raking in a fortune online” is again only created to get you to buy their product. These sites all market a variety of kits that are supposed to get you started making money online posting links with Google or some other such bogus opportunity. What’s the Real Scam Here? The worst part about these fake news sites, besides the obvious deception, is that the programs they sell are ripe with hidden charges. They claim that you can sign up for just the cost of shipping and handling but in reality that is just a short trial period after which they use your billing info to charge you a large monthly fee. The only place that this is revealed is deep in their terms and conditions pages which are linked to at the very bottom of these websites. The majority of people never see them and consequently have a series of charges on their credit cards that they never authorized. Many government authorities have been notified about these persistent scams but they have yet to issue wide sweeping regulations to combat these sites. Even worse, as soon as one site gets busted another pops up to replace it almost instantaneously, so the best way to protect yourself is to learn how to recognize and avoid these scams. You may see variations of these sites but the general layout is the same and the only thing that changes are the names of the couple or person in the picture, a few details about the bogus job that was left to pursue internet riches, and as mentioned before the name of the town that the “paper” is supposedly from. The bottom line is if you see something similar to this do not buy whatever it is they’re selling as it will cost you a lot more down the road. Keep in mind that these internet scammers are getting more clever by the day and once this tactic stops converting they will move on to something else. I’ve already seen some sites posing as Yahoo or Wiki Answers, which is why it’s important to use your best judgment at the time of your decisions; by the time articles like this get enough recognition it may be too late. Foolishly, I haven’t been keeping a list of all the fake news sites I’ve come across, but if you’ve seen some please post a comment here and I will add them to this ongoing list.